Space Duel was the follow up to Asteroids and Asteroids Deluxe. While the overall game play resembles those previous games it does contain a number of unique features. To start off with, it has a very distinct look that is the result of leveraging a color vector monitor and replacing the rocks with different geometric shapes (cubes, diamonds, pinwheels, etc.). Looks notwithstanding, what makes Space Duel truly unique is its multi-player support. In fact, it is the only multi-player vector game ever produced by Atari. The first (and most obvious mode) for multi-player allows two players to man their own ship. The other multi-player mode which is much less obvious allows for two players to be tethered together. In this mode it is critical that the two players thrust together or the ships will be sent into a wild spin. It should also be noted that this "tethered" mode was available in single player as well. Growing up, I remember seeing Space Duel at several local arcades, but probably only played it a couple of times. While I don't remember exactly why I didn't play it, I believe it may have to do with the fact that Donkey Kong was released at about the same time. I am guessing this is the reason that it wasn't more popular at the time. 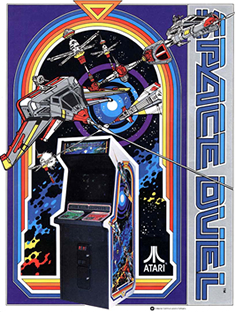 Most people had probably moved away from the initial "space-themed" games and onto the more character-based and colorful games such as Donkey Kong and Ms. Pac-Man. Even though I didn't play it as a kid, I really wanted to add a Space Duel to my collection. What sparked my interested in Space Duel was playing it at our local retro-arcade, Ground Kontrol, with a couple of friends from work. It really provides an addictive multi-player experience that is rare among those early arcade games (Another great multi-player game is Joust). I acquired my Space Duel from a local collector who had made a post on the KLOV forums. It already had an LV2000 installed, and he said its deflection and HV boards had been rebuilt by Anthony Ramos (Ground Kontrol). So, I really haven't had to do any repairs on the game with the exception of adding some new coin door bulbs.